Pumpkin Spice Candied Nuts: you only need ten minutes and six ingredients to make a batch of these sweet toasted pumpkin spice mixed nuts on the stovetop! Happy Birthday to me! That’s right, today is my birthday. I am officially entering into the third decade of my life. As long as I pretend that I am turning 29 again, I feel totally fine about it. Mostly I’m just worried if I am using a strong enough wrinkle cream and am making sure I wear sunglasses so I stop squinting so much. Crows feet are not my friend, y’all. We are going to Mickey’s Not So Scary Halloween Party and then we are off to Epcot Food & Wine. We are so excited to take the girls Trick or Treating at “Mickey’s House” as the girls call it…and I am so excited to eat my way around the Food & Wine fest again! SO MUCH FOOD. I plan on trying to write a post of our favorite eats for anyone else going this year! 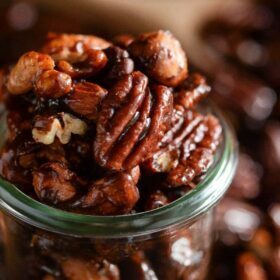 I made these Pumpkin Spice Candied Nuts as a yummy snack for our road trip over to Orlando. Luckily it’s only about an hour and a half drive, but it’s still nice to have some road snacks (and hotel room snacks). The girls have been super into nuts lately and I’m excited to have a new way to get protein and healthy fats in their diets. Lyla loves salted pistachios and Ellie has been all about the roasted cashews. 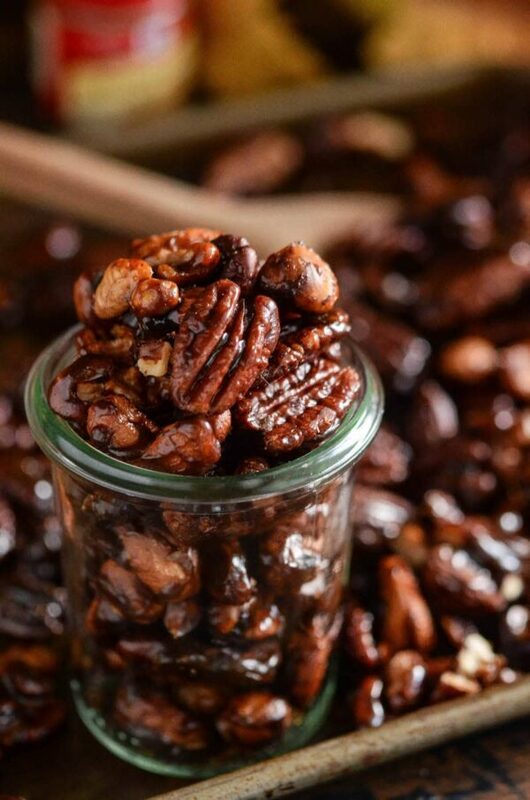 I can’t wait to see what they think of these candied nuts! 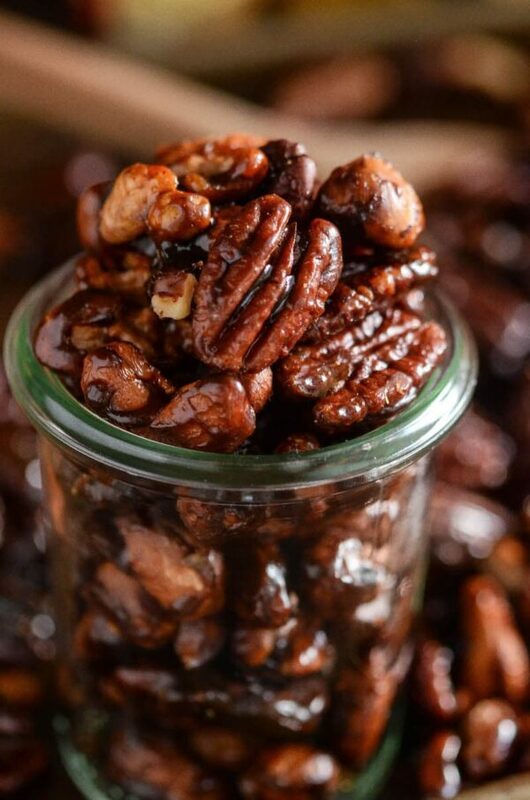 These Pumpkin Spice Candied Nuts are super easy to make on the stovetop in just 10 minutes. If you aren’t into pumpkin spice, you can also use plain cinnamon instead. I used raw mixed nuts (pecans, cashews, almonds and hazelnuts) in mine, but feel free to pick your favorite nuts to use. 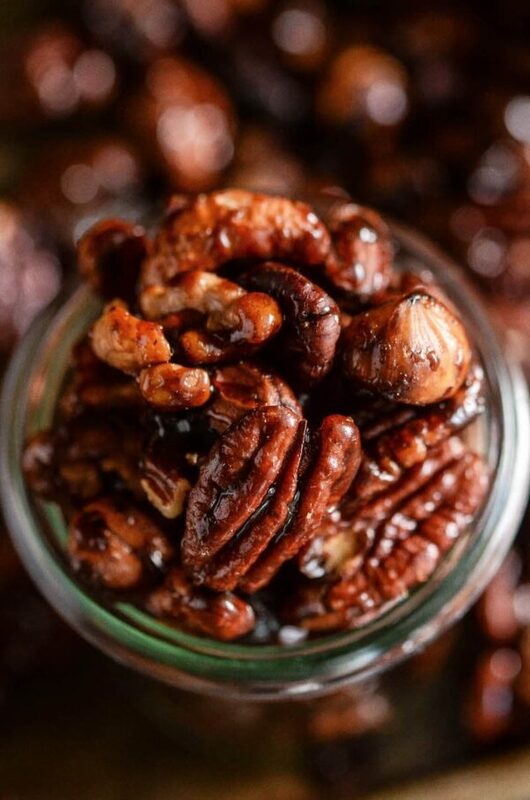 These nuts make a great snack or can be wrapped up in a cute jar for a nice little hostess gift. But fair warning, they are seriously addictive!! Toast nuts in a large sauce pan over medium-high heat. Stir nuts constantly, until fragrant, about 2-3 minutes. Add brown sugar, salt, pumpkin pie spice and butter. Stir until well combined. Add water and stir to combine. Bring to a boil. Boil for 3 minutes, stirring often. Remove from heat and pour nuts in an even layer onto parchment paper. Allow them to cool completely, about 10 minutes, break into pieces. Eat them fresh or store in an airtight container for up to a week. Next Post » What to expect at Mickey’s Not-So-Scary Halloween Party! Omg, these candied nuts must be so delicious! I’m definitely going to try them myself. Thank you for sharing! Parabéns seja muito feliz sempre. essa receita de nozes é perfeita par mim e meus filhos vou seguir a receita e preparar.